I’ve been trawling my way through a bunch of fashion blogs the last few days. They rather are the flavour of the moment and differ quite considerably in content. Some are snaps of stylish people on the streets. Some are sort of picture diaries – What I am wearing today – type blogs. There are snaps from insiders at shows or of stylists at work. And there are self proclaimed fashionistas waxing over the latest must have item. This blog is nothing like any of them. I am not an insider and I am trying very hard not to buy anything at all. The only thing I have in common with other fashion bloggers is a love of clothes. This blog shares ways that I come up with to recycle clothing, jewellery and create the latest fashions out of as little as possible. I also show very easy items to sew and make that can give an existing wardrobe an upgrade. 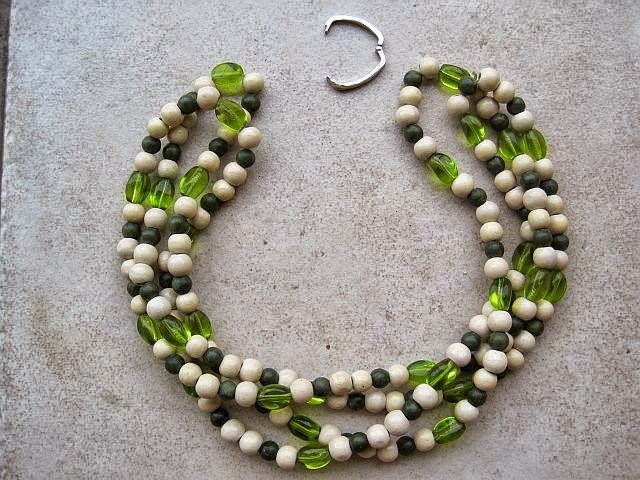 Todays’ post shows how easy it is to get a twisted bead necklace. You need a rope, or two, or three of beads. Fold them in half and again if necessary to get the desired length. Give the ropes of beads a twist or two. Use a clasp as per the picture to hook each end and close it at the back of your neck. If you can’t find a clasp like this in your local bead shop, a large safety pin should do the trick.